An elegant and modern sport horse stallion with stunning proportions, expressive paces and bold scopey jump now standing at Pennine View Stud in Harrogate, Yorkshire. Pennineview Silver Concorde is excelling in dressage with his effortless smooth paces, having recently got 68.9% in his first affiliated elementary. He has won on most of his other affiliated dressage outings, qualifying for Novice Regionals in the summer 2014. He qualified for the Petplan Championship’s. For 2016 we are looking to utilise his effortless jump and bold attitude to cross country and hope to build on his previous placings in British Eventing. He is a thoroughly modern sport horse stallion with potential to excel in all disciplines. 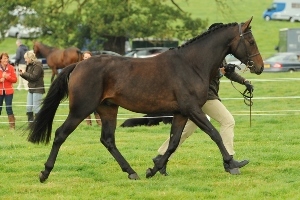 His major accolade was coming 2nd in the National BEF Futurity Eventing 3yo class at Osberton 3yo class. Only being beaten by a 3rd generation horse from Jennie Loriston Clarkes which went on to take the overall championship BEF Futurity eventing stock that year. In 2015 we had his first foals, a stunning colt out of a the half sister to Opposition Buzz and an elegant filly out of a SHB mare by Classic out of a Welton Crackerjack lines. We are looking forward to seeing how they develop. lorry. He behaves impeccable at events with crowded warm-ups and is a pleasure to handle. An exciting prospect for 2016 both to compete and breed from. He has natural covering, fresh and frozen seamen available and will be standing at Pennine View Stud Harrogate N Yorks in 2016.